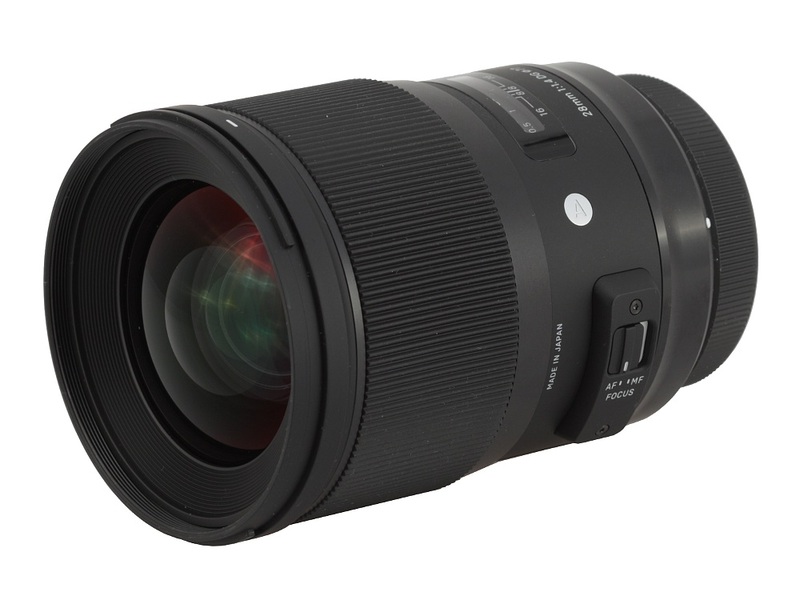 The following chart shows basic parameters of the tested Sigma, its f/1.8 predecessor, and other full frame 1.4/28 lenses available on the market. It is immediately clear that, when it comes to physical dimensions and weight, the Otus is in a league of its own. 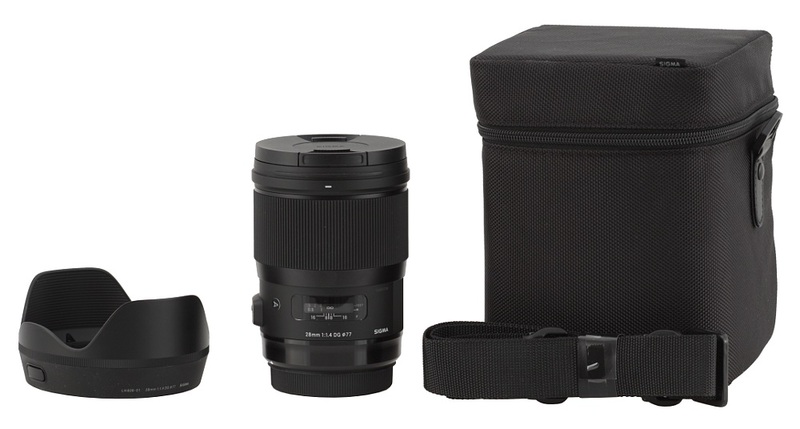 The Sigma is bigger and heavier than the Nikkor but not exceedingly so - especially as it is optically the most complex model in this group. The Leica remains the smallest and the lightest. 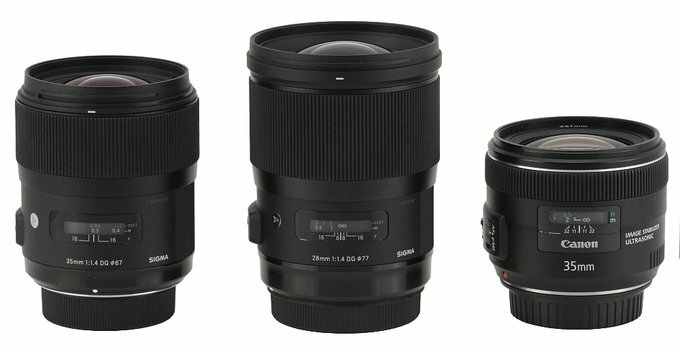 In the photo below the Sigma A 28 mm f/1.4 DG HSM is positioned next to its older A 35 mm f/1.4 DG HSM brother and the Canon EF 35 mm f/2 IS USM. 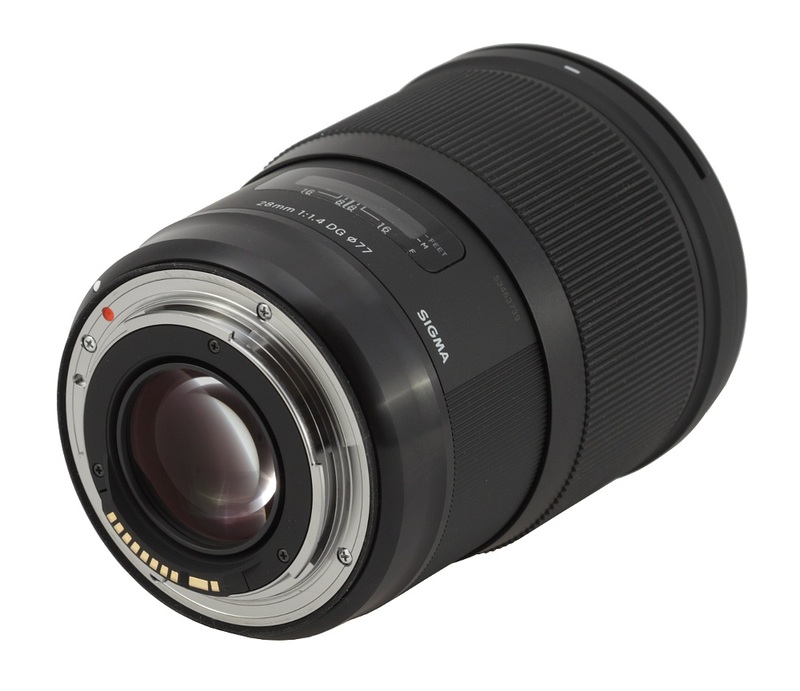 The tested lens starts with a metal mount surrounding contacts and a rear element, 32 mm in diameter. The element moves, being positioned on the same level as the mount with the focus set at infinity, and it hides less than 1 cm inside the casing when you pass to the minimum focusing distance. The revealed interior of the tube is well matted and ribbed, without any bigger slits or sticking out electronic parts. 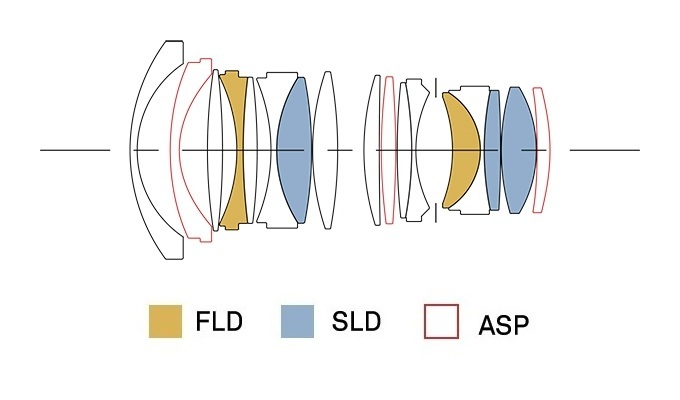 The front element, for a change, doesn’t move which means that during focusing the optical system changes its position and so does the focal length. 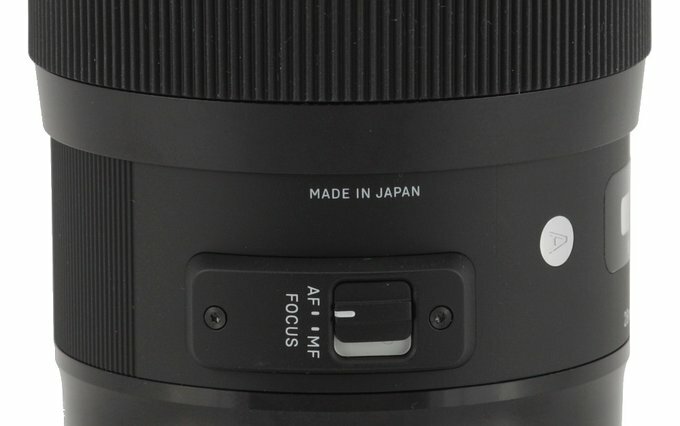 The proper barrel of the lens starts with a smooth, black ring made of metal which features a white dot, making an alignment with a camera easier, and an inscription “019” meaning the year of the launch. Further on you see the name and parameters of the lens and, above them, a distance scale, expressed in feet and meters and hidden behind a window. Below that scale there is a depth of field scale but with markings just by f/8 and f/16 apertures so only moderately useful. On the left side of the scale you find “A” letter meaning the lens was classified as an “Art” device, then an inscription “MADE IN JAPAN” and a focusing mechanism mode switch (AF/MF). The next part is a manual focusing ring, very big, 48 mm wide, most of its surface covered by comfortable, rubber ribbing. The ring is properly damped and quite smooth to operate; running through the whole distance scale takes a turn through an angle of about 100 degrees. Right behind the manual focus ring you see a hood mount. It goes round a non-rotating filter thread with an impressive diameter, that of 77 mm; the filter thread surrounds a front element which doesn’t move and is 55 mm in diameter. The front element is slightly convex and hidden a bit inside the casing. The area around it is well blackened and additionally ribbed. When it comes to optical construction you deal here with as many as 17 elements positioned in 12 groups. The number of special elements included is truly impressive: two FLD elements, made of low dispersion glass with properties similar to fluorite, three low dispersion SLD elements and three aspherical ones. Inside you also find a round aperture with nine diaphragm blades which can be closed down to a value of f/16 at the maximum. Buyers get both caps, a hard case with a strap, and a petal-type hood in the box. The hood is of a new type, the one we’ve seen already with the 1.4/40 Sigma model. It consists of two parts, the classic plastic one, similar to other hoods of this producer, and the rubber one, situated closer to the mount. 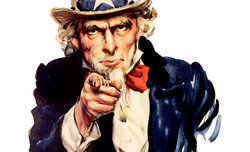 I don’t completely grasp the reason behind such a construction which, in my opinion, spoils the aesthetics of the lens. The rubber part catches dirt and dust easily; it looks a bit shabby even right after taking it out of the box.